What to do with your ponies when winter blows! As anyone who knows me will attest, I hate the cold. This winter, we’ve experienced some desperately cold temperatures, which have derailed training plans and limited riding opportunities significantly. While I know there is a school of thought that suggests that “if you might be competing in it, you should school in it,” I am not a huge fan of working the horses too hard when it’s bitterly cold out. I wouldn’t run in the cold because it’s hard on my body and my lungs, and I believe this to be true for the horses as well. With winter coats, sweating causes chills, and it’s impossible for horses to dry out in this weather. And of course, I hate the cold. 1. Bundle up and spend some quality time with the horses. My horses are out 24/7 and they have access to shelter, heated water, and excellent hay. When it gets bitterly cold, and the wind blows incessantly, I put on my polar gear and trek out to the barn to bring them in for a break from the elements. These times are usually quiet at the barn, and a great opportunity to give Chaos and Dayo a warm mash, take off their blankets to ruff up their hair. Sometimes I’ll do maintenance – main pulling, fetlock trimming, other times a thorough and leisurely grooming. Sometimes it’s just cuddles, and they take advantage of the peace and quiet to wander around the barn, visiting other horses, and exploring that world. 2. Develop detailed training plans. I’m a professional event planner, and a firm believer that success lies in the details. When it comes to the horses, I am no different. Coupled with this is the fact that Dayo, Chaos and I all seem to get bored rather easily. 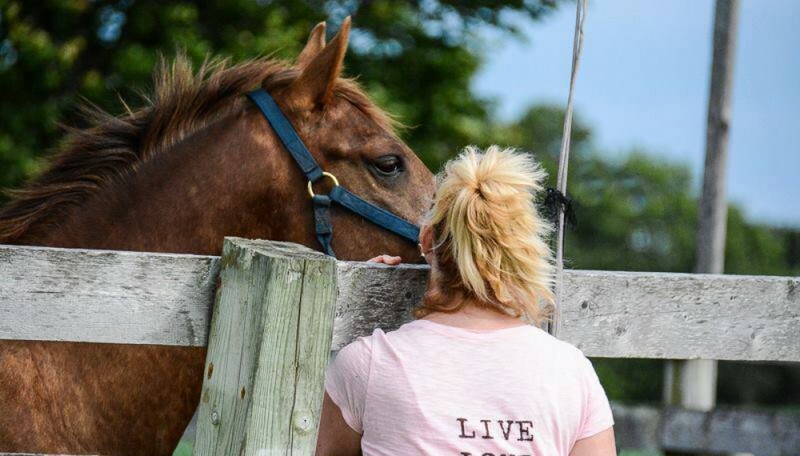 And so, each of my horses has a training plan, and when it’s too cold to ride, I use the time to project, set milestones, goals (horse shows and classes) and develop strategies to make sure every ride counts. Cold weather means sitting indoors, snuggled under a blanket – a great time to explore training ideas for the horses, to look up new ground work exercises, and to plan out lessons with jumps and poles. I’m a HUGE fan of poles – you can do almost anything with them – and they constantly offer the opportunity to challenge the horses. An added benefit for me, because I have time constraints at the barn, is the fact that pole exercises can be adjusted for Dayo, who is quite green, or amped up for Chaos, for is fairly advanced. One of my favourites to build on is 4 Poles, 7 Exercises. A google search will give you many more! 4. Get better – part 2! Study the habits and skills of really good riders. There is so much information out there, and so many great riders to emulate! I watch hours and hours of video – jumper classes, schooling videos, and read books. Some of my favourite videos come from the Bay Area Equestrian Network, and from the pros like Bernie Traurig, Tim Stockdale, George Morris, Denny Emerson, and Jim Wofford. I’m also reading Denny Emerson’s book, How Good Riders Get Good, and looking forward to reading Bill Steinkraus’ Riding and Jumping. A friend recently turned me on to the De Nemethy method. I get caught up on the Grand Prix action, zooming in to see how the riders use their hands, their seats, and how they approach the courses. One of my favourite vids features Margie Gayford and Stuntman – there’s a part where you can actually see her fingers talking to the horse. 5. Get Better – part 3! Winter is also the time to hit the exercise ball, the yoga studio, the gym and the pool to build core strength, improve flexibility, and get in shape to ride! I’m not saying I’m as dedicated to the non-horsey fitness pursuits as I should be, but a girl has to do something besides hide under a blanket when she’s not in the saddle! 6. Do some ground work. Ground work is invaluable for horses, and particularly for Chaos, who can be, well, pushy sometimes. When the barn is quiet, it’s nice to take advantage of the long wide aisle to work on some basics, and re-establish connection. My daughter Emma is a huge fan of this, and much better at it than I am, so ground work time is also daughter teaching mum time. More bonding time for ponies and people! Spring is just around the corner, and there will be much fun in putting plans into action.